I’ve recently discussed the speed and ferocity of the relative decline in commodities vs. stocks since the former, via the CRB Index, peaked in 2008 vs. the DJI. At the ratio’s recent low in Jan-18 it had fallen > 81% vs. its 2008 high. Per the chart below, that’s tied for the fourth biggest decline on record dating back to 1914. However, the speed of that decline – 115 months – is fairly unprecedented. For instance, the 81% decline from 1948-1961 took 167 months, or an additional four years. Even the smaller 78% decline from 1974-1987 took 155 months. The biggest declines on record in the ratio – 85% (1917-1929); 86% (1948-1965); 93% (1974-1999) – took 141, 213 and 296 months, respectively. 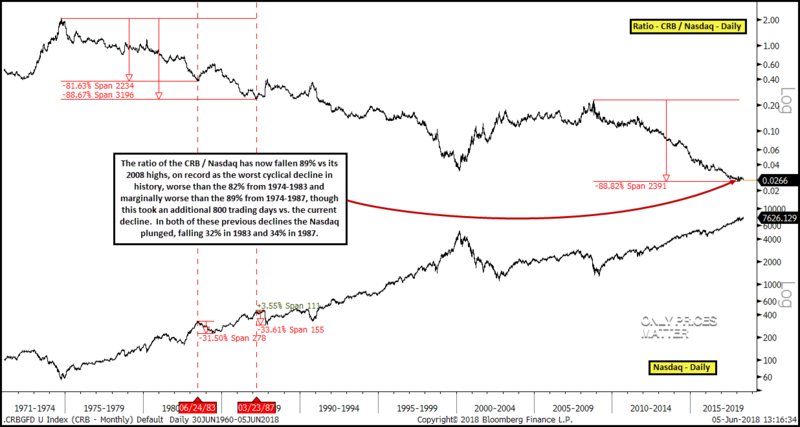 My point here is not that commodities can’t continue to decline vs. stocks over the remainder of the cycle; ex the decline into 1999 which I view as a historical outlier (93% peak-trough over nearly 300 months), history shows that ~85% peak-trough declines in commodities vs. stocks have occurred twice. 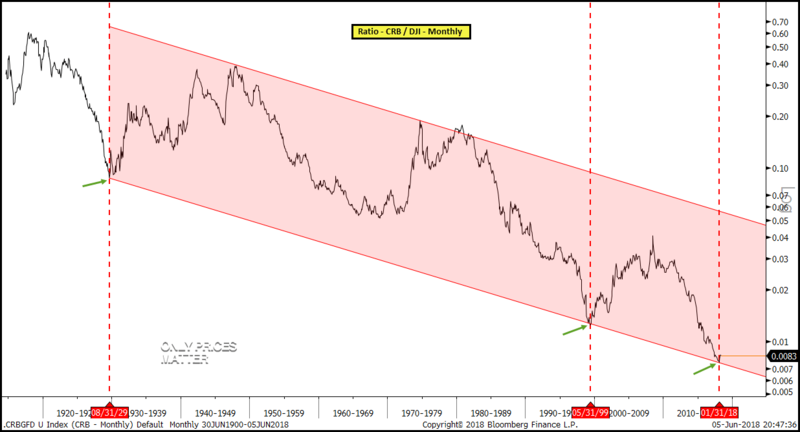 For such a decline to occur vs. the 2008 peak in the CRB/DJI ratio, the former could decline another 15% as the latter rallies 20%, or CRB = 170 / DJI = ~30K. However, the point I am making is that this would likely have to occur over a more prolonged period of time. Unless this cycle is a historical anomaly in terms of time, history suggests that additional CRB/DJI downside likely comes over the next ~24-36 months, or into months ~140-155 vs. the current 115. Thus, if it takes ~three years for the DJI to reach 30K, you’ll be posting nominal annual returns of only ~6oo-700 bps, hardly epic in the context of recent years’ performance and ignorant of the likely volatility required to generate that upside. Even if I’m wrong and additional downside in the ratio comes harder and faster, it will quickly manifest itself as one of the greatest tops in history. 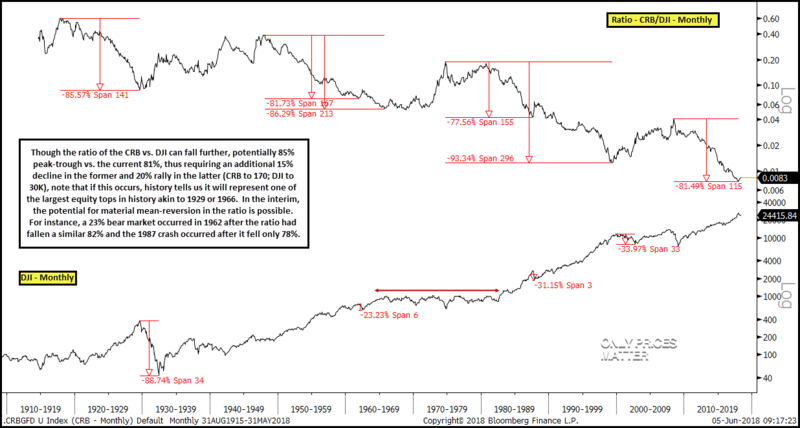 Per the chart below with the CRB / DJI ratio in the top pane and the DJI itself in the lower, ~85% peak-trough declines in the ratio coincided with the 1929 and 1966 tops – one a Depression and the other a secular bear. 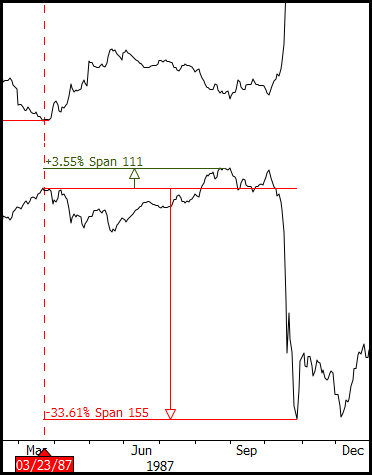 In the interim, note that abrupt mean-reversion events in the ratio (i.e., large, but temporary equity declines) are possible before any ~85% peak-trough decline might occur. For instance, the ratio fell a similar 82% into a 1962 high that coincided with a DJI top and 23% bear market (monthly; more on a daily basis) and only 78% into 1987 prior to the October crash. And I haven’t even addressed the fact that the epic 81% decline in the CRB / DJI ratio since 2008 into the Jan-18 pivot low just happens to be where historic channel support in the ratio sat…the same channel support that came at the DJI’s 1929 and 2000 highs (the ratio hit channel support in May-99, or ~eight months prior to the Mar-00 peak). But, if the CRB / DJI ratio doesn’t convince you, perhaps the CRB / Nasdaq will instead, which is plotted below. Note that the 89% decline off the 2008 high is the worst cyclical decline on record, besting the 82% from 1974-1983 and even the <89% from 1974-1987. It must be emphasized though that the current 89% decline has happened very quickly at ~2,400 trading days, or ~800 less than the ~3,200 it took from 1974-1987. Either way, the decline into 1983 produced a 30% Nasdaq bear market and the one into 1987 speaks for itself. Not to mention, per the chart above, throughout 1987 the index’s pattern didn’t look remotely bearish. In fact, after the Mar-1987 peak, the consolidation and subsequent break-out made a compelling case for sustained upside, certainly well beyond the Aug high given the strength of trend that was already underway (doesn’t momo = more momo?). This runs afoul of the idea that the market always gives you a heads up before it breaks; while the DJI was ~12% off the Aug-87 high in Oct-87 just prior to its crash phase, per the analog below, up until 10/8/87 the Nasdaq was still trading above its initial May-87 swing high peak! But perhaps most troubling of all is the chart below: note the monumental technical resistance at hand for the Nasdaq ~400 bps above the Jan-18 swing high. The only time the index has ever been above this resistance was from late 1995-2000 for the tech bubble; otherwise, it has caused every major pivot in the index’s history, including, coincidentally, the Mar and Aug-87 highs! With the CRB / Nasdaq already down 89% – as much as it was into Mar-87 and ~three years faster – what is your bet as this resistance comes into play? 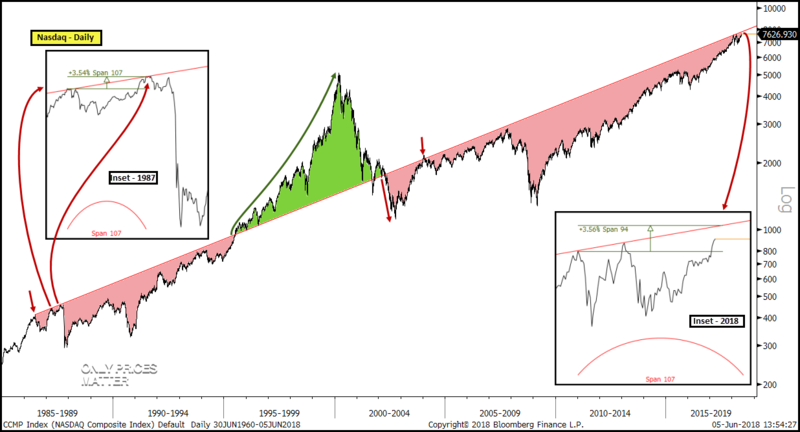 Shall we manage a 1995-2000 redux and blast above the meridian line for another parabolic move (not including the parabolic move underway since 2016)? With the 1987 set-up equaling 107 trading days peak-peak Mar-Aug and + ~400 bps (354 bps to be exact) and the current Jan-18 swing high now 89 trading days in, the betting window looks like it will close soon. 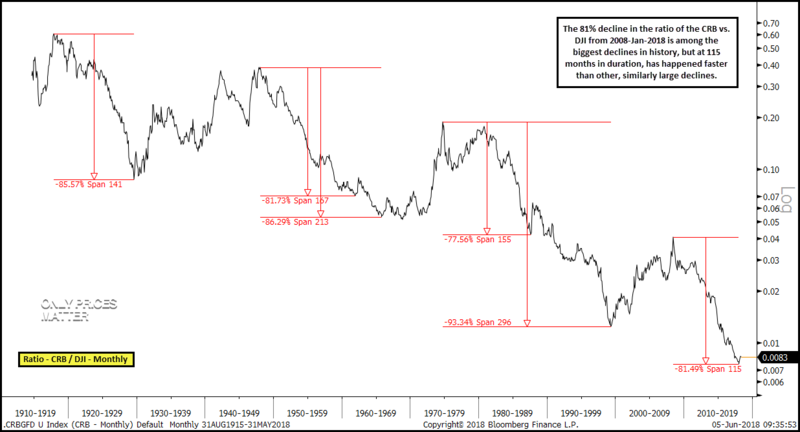 Or, with > 100 years of history in our back pocket do we find that the current run for stocks vs. commodities appears to be reaching a highly critical juncture, one that suggests the potential for nasty mean-reversion in favor of commodities in the short/intermediate-term, or, conversely, an area that will act as a governor to additional stock out-performance on both a time and price basis over the longer-term? At a min, given how fast the to-date decline has been in commodities vs. stocks, I simply don’t see how they at least keep pace with equities moving forward, should the latter continue to rally. In terms of simple risk/reward dynamics, I much prefer exposure to a historically over-sold complex than I do one historically over-bought.